By the time August rolls around many homeowners are ready to put away the garden tools and ease into autumn. But the end of the hot weather is a perfect time to put in those fall flowers that will continue the color in your yard until first frost. There are many varieties to choose from, so let’s review some of the best possibilities. 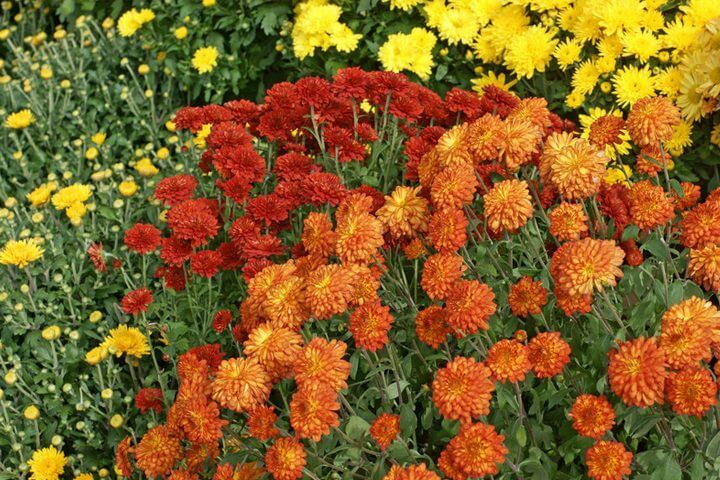 The mum is a favorite for bright bursts of color in autumn. Though they are really perennials most gardeners (and many growers) use them as annuals. They are a wonderful choice for borders, mass plantings and sharing containers with other fall flowers. They will add both height and fill to your potted plant designs. Chrysanthemums offer a terrific array of shape and color. The color range is vast but the most popular for autumn are the many shades of yellow, orange, maroon, rust, and red. When choosing a plant, look for one that has tightly closed buds that are showing only a small bit of color. This will offer you the longest bloom time in your garden and also ensures that the plant is at its peak. Give your mums at least four hours of sun a day and make sure the soil is kept moist. Foliage plants are not always a consideration for gardens and containers, but kale and cabbage are excellent choices for cool weather color and texture. They two plants are easy to grow and will look terrific throughout the fall season. For a small investment and very little maintenance, this colorful foliage makes a beautiful backdrop for flowering plants. Like most fall flowers they prefer lots of sun and well drained, moist soil. The beautiful ruffles of leaves will tolerate cold weather and hold on to their vibrant shades of vivid green to deep purple. When choosing plants look for ones that are compact and full of rich color. Kale and cabbage are especially nice in pots where you can get close up and appreciate their unique texture. If planting in the garden, they will look best in groups of three or five. Pansies may be one of the happiest fall flowers you will ever put into your garden and their bright little faces will add great pops of color to flowers beds and containers. The colors are remarkably striking – with shades that include bright white, blazing orange, vibrant yellow, muted pinks, and all shades of purple from violet to deep blue. Give pansies bright sun and cool weather and they will be dependable bloomers for weeks into months. Today many of the hardy varieties will last until the spring heat rolls in. Many garden centers these days now carry a wide selection of rudbeckia arriving fresh from growers in the fall. These varieties include a range of the Black-eyed Susan family and Gloriosa Daisies. Their colors are perfect for the fall garden offering a hot palette from mustard yellow to deep maroon, with orange and rust in between. The tall, spikey flowers are a stand out in beds and pots with the bonus of being an exceptional cut flower lasting a long time in a vase. In you have containers that are starting to wain and need a boost, there are shorter varieties of rudbeckia that can be placed into existing designs to add an unexpected pick me up. Asters are daisy-like perennials with starry-shaped flower heads. They bring delightful color to the garden in late summer and autumn when many of your other summer blooms may be fading. These plants look terrific equally terrific in the garden bed or in a pot. They don’t require much water so be careful not to group them with other fall flowers that need a moist environment. Though asters are perennials, like mums and rudbeckia, they pop up abundantly in nurseries for a cheerful addition to your fall flowers. If you buy an aster bred to be hardy, they should perform well as a perennial to at least USDA Zone 4. Keep in mind that fall is a good time to refresh your garden and to think about how you’d like to expand it for next year. The cooler temps make it easier for plants to adapt to their new home and set a sturdy root system. It’s the perfect time to put in your favorite spring blooming bulbs, like tulips, daffodils, and allium. You can add new perennials and shrubs carefully planned to give you blooms through three seasons. Make the most of this time of year – make your garden bloom brightly!